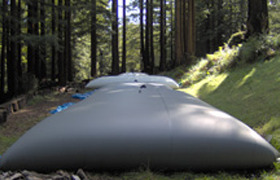 Flexible Tanks are a low cost storage option designed to safely store potable water, waste water, fuels, hydrocarbons and a range of other liquids. Made from robust, high grade fabrics and materials, these tanks are used for short term storage, military applications, fire fighting, temporary tank repair, fuel storage, bulk liquid storage and more. In order to accommodate different flexible storage requirements, available tanks include pillow tanks, fire fighting tanks, onion tanks, and more. Please view our variety below for more information regarding these bladder tanks and storage options. 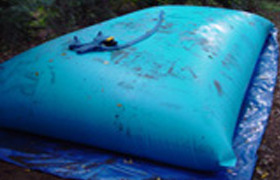 One of the most popular flexible storage tank options is a Pillow Tank. 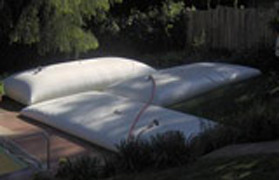 Pillow tanks are constructed from flexible materials that allow the tank to lie completely flat when empty. As the tank fills with liquid, it will rise to form the shape of a pillow. 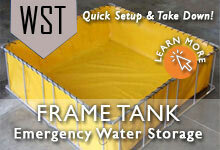 This allows tanks to fit neatly in low profile areas or in wide spaces/storage locations. In addition to the closed pillow-style tanks, we also offer open top storage tanks such as folding frame tanks and self-rising onion tanks. Known for their ease of use and set up, these tanks set up in minutes to address emergency fire fighting or water supply requirements. 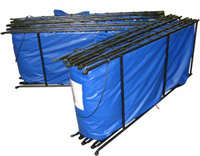 Additionally, both tanks are designed with a folding or collapsible structure that allows them to be easily transported from one site to the next. One of the most common applications for these open top units is for use in rural or forest fire fighting. In these remote locations, finding a source of water is often difficult. 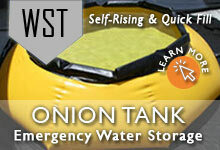 Open top frame or onion tanks can provide a large liquid containment pit to hold water while fire trucks and water bowsers get more supplies. 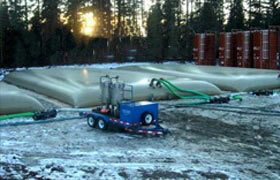 Additional flexible tank options include frac tanks, and cistern liners to assist in your liquid storage requirements.